Long-chain-fatty-acid--CoA ligase 3 (ACSL3) belongs to the ATP-dependent AMP-binding enzyme family. Acyl-CoA synthetases (ACSL) activates long-chain fatty acids for both synthesis of cellular lipids, and degradation via beta-oxidation. ACSL3 mediates hepatic lipogenesis. ACSL3 has mainly an anabolic role in energy metabolism. ACSL3 is required for the incorporation of fatty acids into phosphatidylcholine, the major phospholipid located on the surface of VLDL (very low density lipoproteins). 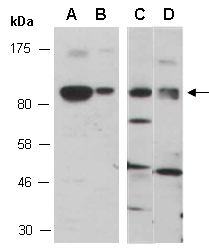 Rabbit polyclonal antibodies were produced by immunizing animals with a GST-fusion protein containing either the N-terminal [ACSL3 (N) (R2379-1)] or the C-terminal [ACSL3 (C) (R2379-2)] region of human ACSL3. Antibodies were purified by affinity purification using immunogen. ACSL3 at RT for 2 h.